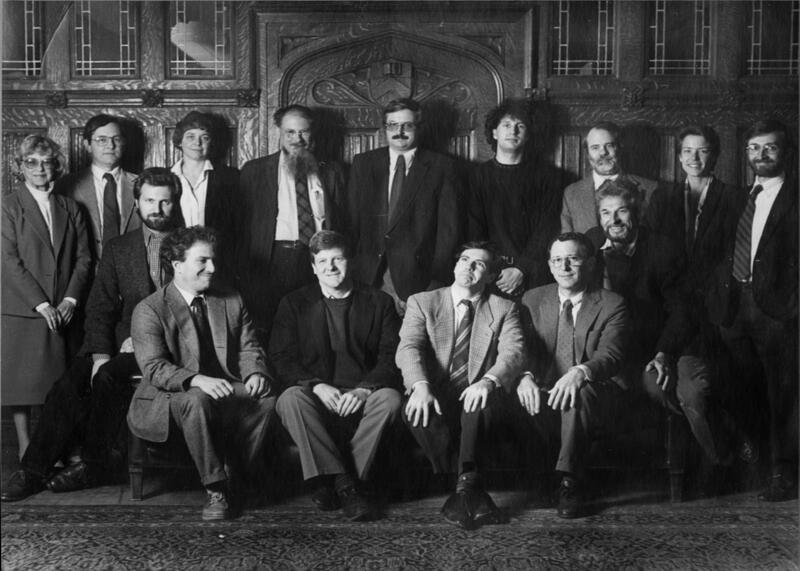 In 1988-9, the full professors included Paul Benacerraf, John Burgess, John Cooper, Michael Frede, Gilbert Harman, Richard Jeffrey, Saul Kripke, David Lewis, Bas van Fraassen, and Margaret Wilson; the associate professors included Robert Freidin, Mark Johnston, and Scott Soames; and the assistant professors included Don Baxter, Stewart Cohen, Sally Haslanger, Stephen Neale, and Michael Smith. Christopher Peacocke gave the Three Lecture Series (later the Carl G. Hempel Lectures). Years ago, I heard about a sign pinned to an office door in Princeton, New Jersey. The office door was Gilbert Harman’s, and I was told the sign read, ‘Just say no to the history of philosophy’. ‘Just say no to the history of philosophy’—a clear echo of Nancy Reagan’s ‘Just say no to drugs’. When I was told this story, I believed it. I took it that Harman’s sign expressed one prominent analytic philosopher’s deep antagonism to the history of philosophy, and I wondered where that antagonism came from. Many analytic philosophers I knew were uninterested in or bored by the history of philosophy, but not usually hostile, and I wondered why Harman seemed to be more vehement. I doubted that Harman thought the history of philosophy so addictive that he had to warn people against it in the manner of Nancy Reagan, but apparently he did. I e-mailed Harman, saying that I gathered he was critical of the history of philosophy, and asking whether it was true that he had once put that notice on his door. ...I believe my views about the history of philosophy are mostly orthodox nowadays. The history of philosophy is not easy. It is very important to consider the historical context of a text and not just try to read it all by itself. One should be careful not to read one’s own views (or other recent views) into a historical text. It is unwise to treat historical texts as sacred documents that contain important wisdom. In particular, it is important to avoid what Walter Kaufmann calls ‘exegetical thinking’: reading one’s views into a sacred text so one can read them back out endowed with authority. For the most part the problems that historical writers were concerned with are different from the problems that current philosophers face. There are no perennial philosophical problems. On the whole, these views about the history of philosophy are quite close to those of my late friend Margaret Wilson. For reasons I do not fully understand, I have sometimes upset people by distinguishing between philosophy and the history of philosophy or by noting that philosophy is what the history of philosophy is the history of. I also think as an empirical matter that students of philosophy need not be required to study the history of philosophy and that a study of the history of philosophy tends not to be useful to students of philosophy. (Note ‘tends’.) Similarly, it is not particularly helpful to students of physics, chemistry, or biology to study the history of physics, chemistry, or biology. Of course, it may be helpful for students of physics to start with classical Newtonian physics before taking up relativity theory and quantum mechanics. But it tends not to be helpful for them to read Newton. The playful sign that was once on my office door, ‘History of Philosophy: Just Say No!’ was concerned with whether our students should be required to do work in the history of philosophy. That is not to say that I have anything against the study of the history of philosophy. I do not discourage students or others from studying the history of philosophy. I am myself quite interested in the history of moral philosophy for example and have occasionally taught graduate seminars in Kant. I have done a certain amount of work on Adam Smith’s relation to Hume and others. Sorrell goes on to explain why he thinks it is so important for philosophers to study the history of philosophy. At Princeton, Cooper had taken issue with what he saw to be an implication of Harman's suggestion that "philosophy is what the history of philosophy is the history of", namely, that the subject could just as well be studied in history departments. Though many historians of philosophy agree with that view, Cooper insisted that there is a distinctively philosophical approach to the study of the history of philosophy, a view he explains in his contribution to "Historians Look at the New Histories of Philosophy". These days, the department boasts a full complement of historians: Hendrik Lorenz, Ben Morison, and Alexander Nehamas in classical philosophy, and Dan Garber and Des Hogan in modern philosophy.